So you have decided to build your own computer. If you’ve never done this before, it can be a daunting prospect. Just opening up a computer and looking inside can be a bit intimidating. Once the parts start rolling in, it can get even more intimidating. 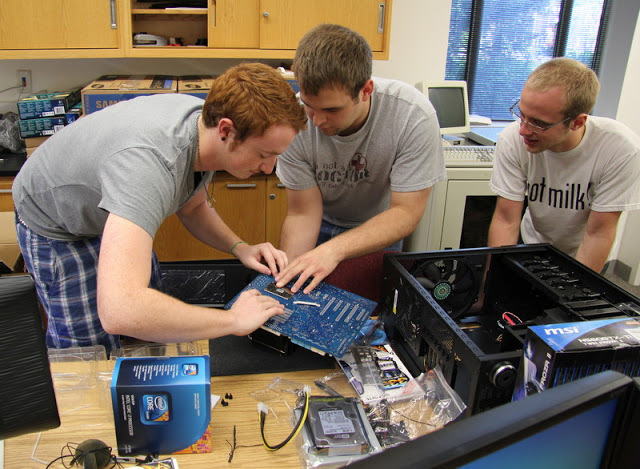 So here is a list of six things that you need to remember when building your new machine. Before you ever start ordering, you need to know what you need. Write down everything you will need to get for your new box. You’ll need a CPU, a heatsink and fan, RAM, a graphics processor, a hard drive, a WiFi card, a case (with power supply), and a motherboard. To get started, check out Coast Automation. You need to start with researching and picking components, because they will have to be able to work together. Getting top-line components is great, but if your case only comes with a 300W power supply, you might have a problem. Make sure that your components can work together smoothly before you get everything installed. This will save a lot of time and money in the long run. You also need to make sure that you have the right tools for the job. Small screwdrivers, small sockets, small tweezers and more are a key to a successful build. There is not a worse feeling than tightening that last screw, plugging in your new computer, turning it on and having absolutely nothing happen. You Should be testing everything at each stage, before putting it in the box. This won’t take a lot of extra time, and it will save you extra time later on. Components do fail, after all, and it’s a lot better to find out you’ve got a defective part before you get the project done. A small drop in the middle is all you need. When you press the heatsink down, it will spread the paste out for you. Don’t go overboard. This is an easy mistake to make, but easily preventable. Once the parts show up, the temptation is to dive right in and build. First, take a look at what you have and picture how it will all fit together. Think before you start, and you’ll be a lot less aggravated later on. Building your own computer can be stressful enough as it is, so don’t add to the stress by not planning things out before you build. This is a place where good pre-purchase planning will help. Don’t overcrowd the box. The last thing you want is an overheated computer because you saved some money and bought a cheaper, smaller box. The first thing most of us do when we get a new gadget is throw away the box. Don’t do that with component boxes, and especially don’t do it with the static-free bags. You can always sell off old components, and you’ll need something to ship them in. Building your own computer is a great way to get the exact machine you need, whether you want it for gaming, editing pictures and video or business. These tips will help to make sure you have all the right parts and knowledge needed to make it happen. How you build your computer? share with us in the comments below.